StMaartenTours.info offers you the opportunity to book your island tour in advance to your arrival on St. Maarten, whether for the day by cruise ship, or during your vacation stay on the island. We have a wide range of island tours to choose from, including city tours, beach tours, mountain tours, historical tours, shopping tours, restaurant & bar tours, all day tours and our popular tour-the-island-your-way tour. Price: $325 US Dollars for your group; up to maximum 8 persons; $40 for each additional person over 8 persons. If you wish to book this tour via email, please email us and we will send you a payment request via Paypal.com. You can use your creditcard to pay online. You can choose to pay a non-refundable deposit of $80 upfront and pay the balance on the day of arrival to our driver depending on the amount of people in your group. Check out the rest of our tours, trips, transfers, excursions and activities available online at http://www.stmaartentours.info. St. Maarten / St. Martin Island Tours you will never forget. 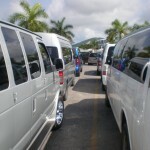 Tours are priced for 1 to 2 persons. Great Discounts available for groups from 3 to 14 persons. Contact us today to book your next tour of St. Maarten / St. Martin.